Associate Attorney General Rachel Brand speaks during the opening of the summit on Efforts to Combat Human Trafficking on Feb. 2 at the Justice Department. The No. 3 official at the Justice Department will be stepping down after less than a year, leaving a key vacancy in the succession of people who are tasked with overseeing the investigation into Russian interference in the 2016 election. 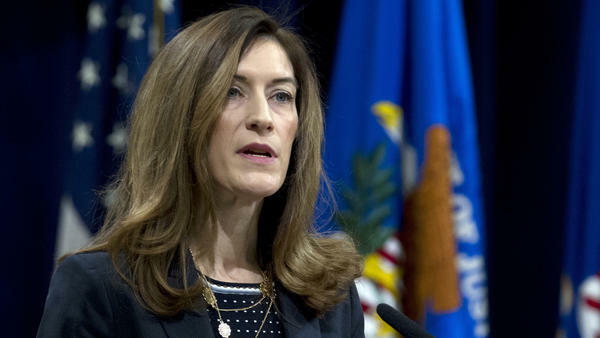 The Justice Department announced Friday evening that Associate Attorney General Rachel Brand will be leaving her job in the coming weeks to take a position in the private sector. A source told NPR that Brand, who was sworn in last May, has been in talks about becoming the top lawyer at Walmart. Other sources said Brand has chafed for months at the limits of her post at DOJ. President Trump has repeatedly attacked the law enforcement agency and sought to cast doubt on special counsel Robert Mueller's investigation into possible ties between Russia and the Trump campaign. Her role at the Justice Department was doubly important because Attorney General Jeff Sessions has recused himself from the Russia investigation, given his role with the Trump campaign. That left Deputy Attorney General Rod Rosenstein overseeing Mueller's investigation, and Trump and GOP allies have attacked Rosenstein at times. Scrutiny of Rosenstein from conservatives allied with Trump escalated last week after a Republican memo authored by House intelligence committee Chairman Devin Nunes, R-Calif., detailed how Justice Department and FBI officials including Rosenstein authorized surveillance on Trump campaign foreign policy adviser Carter Page, who had contact with Russians. Asked last Friday after the memo's release whether he still had confidence in Rosenstein, Trump responded, "You figure that one out," raising the specter he might fire the deputy attorney general. However, the White House quickly denied any plans to remove Rosenstein. But if he was let go, that would have left Brand next in line to oversee Mueller's investigation, among Rosenstein's other responsibilities. "The men and women of the Department of Justice impress me every day," Brand said in a statement. "I am proud of what we have been able to accomplish over my time here. I want to thank Attorney General Sessions for his leadership over this Department. I've seen firsthand his commitment to the rule of law and to keeping the American people safe." Sessions also praised her work, calling her a "lawyer's lawyer." "I know the entire Department of Justice will miss her, but we join together in congratulating her on this new opportunity in the private sector. She will always remain a part of the Department of Justice family," Sessions said in a statement. Brand is an expert in national security and helped defend the administration's efforts to renew a foreign surveillance law. But she had a relatively small staff and a portfolio of issues that focused mostly on civil litigation, civil rights and other issues. In recent months, Brand delivered speeches in the administration's fight against human trafficking. Her office oversees the Antitrust Division, the Civil Division, the Environment and Natural Resources Division, the Tax Division, the Office of Justice Programs, the Community Oriented Policing Services, the Community Relations Service, the Office of Dispute Resolution, the Office of Violence Against Women, the Office of Information and Privacy, the Executive Office for United States Trustees and the Foreign Claims Settlement Commission. Brand was also a top Justice Department official in the George W. Bush administration, helping pick nominees for federal judgeships. And she previously clerked for Supreme Court Justice Anthony Kennedy. "Rachel Brand is a lawyer of the highest caliber and integrity. I was proud to work for her in the Bush administration when she ran the Justice Department's Office of Legal Policy and was proud to call her a colleague at [George Mason University's] Scalia Law School," national security expert and adjunct law professor Jamil Jaffer told NPR. "I'm certain that she'll do great things going forward and will be in public service again in the near future." The news of Brand's departure was first reported by the New York Times.